When is Ethiopian Easter, or Fasika? This post is contributed by Desta Seyoum, who is an Advisory Member on our Board of Directors and local expert in the region where we work in Ethiopia. The celebration of Easter in the SNNPR of Ethiopia is not much different from other parts of the country. 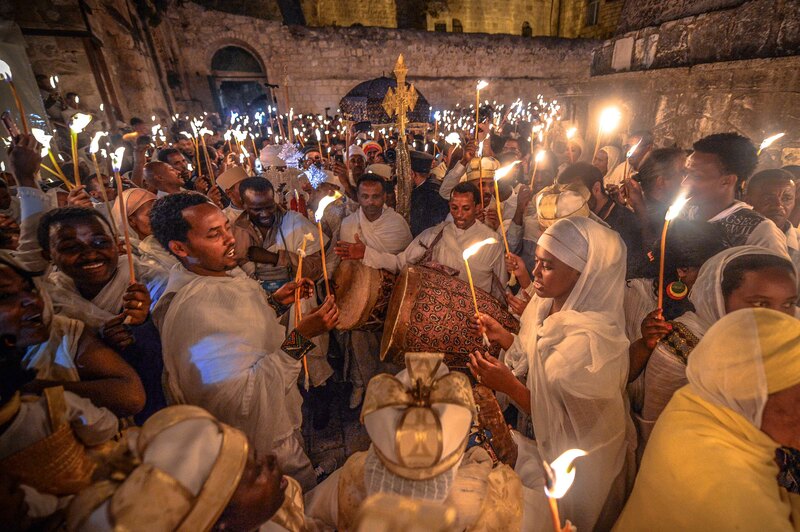 All Ethiopian Christians observe the Easter Holiday. Easter is a widely celebrated occasion throughout the country. This year, Easter falls on April 12, 2015, one week later than the Western Churches. This is because Ethiopia follows the Julian calendar to determine Easter dates. In the Amharic language, Easter is referred to as Fasika, originated from the Greek word Pascha. In both Kembata and Hadiya languages it is called “Shashiga”. In liturgical terms, it is referred to as “Tinsae” means “to rise”. Many devoted Christians also observe Palm Sunday known as “Hossana” and Good Friday “Sikilet”. Members of the Catholic and Protestant Churches which are dominant in the Southern parts of Ethiopia mark the day by attending church services. Followers carry candles to symbolize the resurrection of Jesus Christ. Generally, church services are held in somber moods and are not as colorful as at other occasions. For members of the Ethiopian Orthodox Churches Fasika marks the end of a 56-day period of Lent. On Saturday night, followers attend a church vigil that goes until 3am. When they return home, they break their fasting from meat and dairy products. Easter is an important festival for all Ethiopian Christians as the Resurrection of Jesus is considered more significant than his birth. Easter is also a time for families and friends to get together. Relatives travel from remote areas to join in festivities and express good wishes to their families. The preparation for this special occasion starts weeks before the actual Easter day. Families involved in the time-consuming task of preparing traditional foods that include beautiful details, unique ingredients and lots of passion. They prepare chicken dishes for the symbolic occasion, and lamb for extended feasting. Doro wot (a spicy chicken stew) is the most traditional food served in all families during Easter. It is accompanied by Injera (flat-bread made from Teff). The provision of home-brewed drinks such as Tella (a dark beer from barely) or Teji (honey wine), is abundant for the occasion. Difo-Dabo (a large and round home backed wheat bread) is another food with exotic look and taste. Besides the religious aspect of Fasika, the interesting traditional processing of food, the tantalizing smell of baking bread and injera, the roasting of coffee along with the burning of incense, the smell of firewood and smoke that emanates from many households, the loud songs of churchgoers, the busy open markets and the noise of chicken and sheep on the streets during this time of year enhance the holiday spirit, and spur beautiful memories. This photo was taken by Anthony Pappone Photography. Roots Ethiopia is a 501(c)3 non-profit organization working in Africa, specifically helping Southern Ethiopia. Roots Ethiopia supports community identified solutions for job creation and education. Previous Previous post: Educating Girls in Ethiopia! Next Next post: *UPDATE* Books and Shelving Delivered in Ethiopia!